I knew, stated, and confirmed that I would come back to Xela one day. As much as it was predictable that such thing would happen in the span of July, my last month in Guatemala, I had no idea it would be only after three weeks of living in San Juan. Dreams do come true, I tell you! After only commenting on a picture of beautiful Las Fuentes Georginas (quote-in-quote “WHERE IS THIS PLACE? 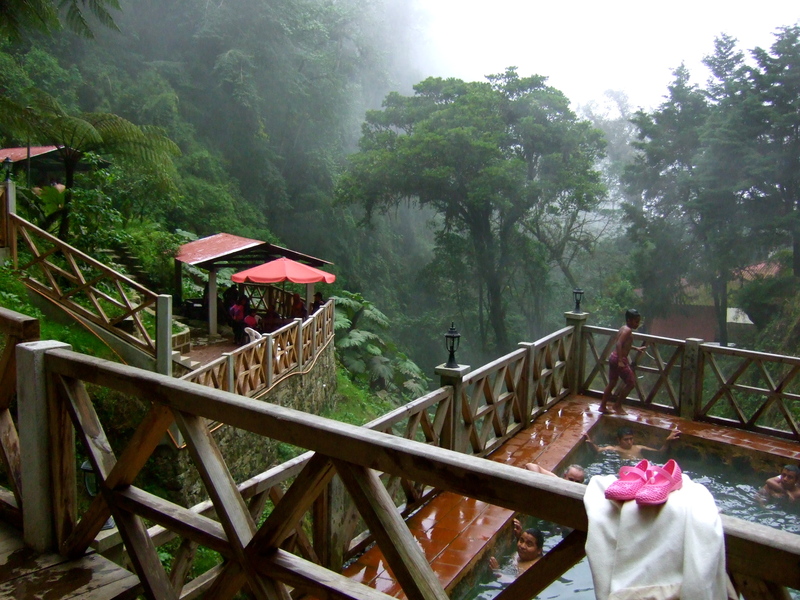 !”), Marina, my friend who decided to share this NGO internship in Guatemala experience with me, had her way to convince us to spend a day in this gorgeous natural spa. It just so happened to be the weekend of my recently acquired friends’ birthday, and guess what? He lives and throws parties in Xela exactly. We packed our backpacks lightly, put away some money for champagne and Quetzalteca (local white rum that has an image of traditionally dressed Guatemalan woman as a logo), made sure our swimsuits are ready and took the infamous chicken bus to Xela (Quetzaltenango). The problem was, the drivers here just want to pack anyone and everyone inside their vehicles, so instead of explaining to us we’re boarding a bus to Guatemala not Xela, they just rushed us in and assured everything’s going to be alright. Instead of just sitting uncomfortably for 3 hours, we ended up hanging out on the side of a “highway” not of out of our own choice and changing buses 3 times before we got where we were supposed to be. Then I realized I don’t know the city as well as I though I did, and we walked forever before reaching our very first and very important stop: Xela Pan. Now, literally it just translates to Xela’s bread, but goodness! This bakery offers quality pastries (real éclairs!) for half a dollar. I’m sort of glad I had to move to San Juan – otherwise I might have ended up twice as heavy as I usually am. Two of us split three of those delicious, creamy mood-lifters, and partied the rest of the afternoon and night away. In the rhythm of salsa, of course! 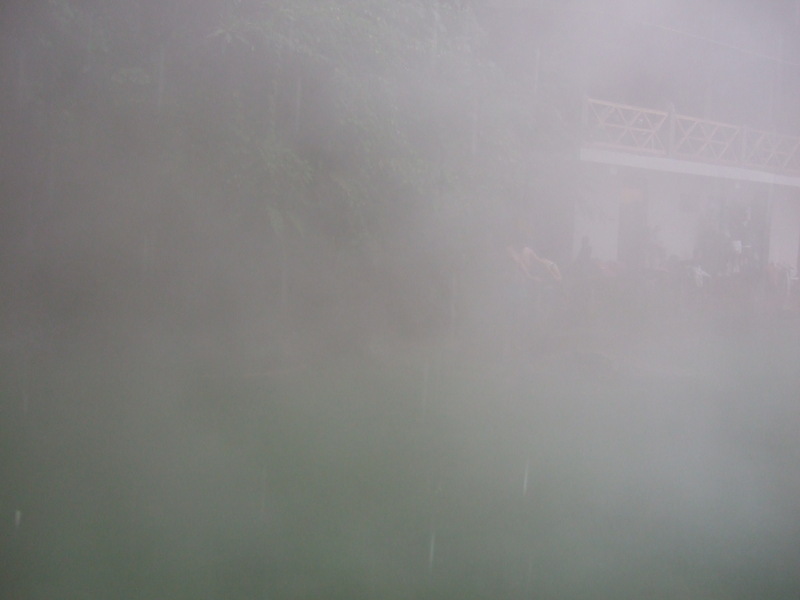 The next day started with a perfect (but scary, since it was incredibly foggy) 20min drive to the Hot Springs, followed by very hangover-friendly relaxation. The weather might not have been the most desired, but feeling the cold rain on our faces while soaking the rest of our bodies in comforting hot water felt incredibly freeing. It very well might have been the first time ever since we started interning that no one thought about work, at least for an hour or two. With all the skin hydration and wrinkly fingers, we ate tortillas like one should in Guatemala and drove back, a little less tense about the road and actually… anything else, really. Too bad that on our way back, all the relaxation faded away as soon as we heard “Buses to San Pedro don’t run on Sundays”. Perfect. Three bus-switches later, we just went for a tuk-tuk (aka rickshaw) lift and fell onto our respective beds. Sleeping after that weekend was even more delicious than the Xela Pan éclairs. Especially because I most surely dreamt of them. This entry was posted in Central America, Guatemala and tagged bus, central america, Chicken bus, guatemala, hangover, hot springs, Las Fuentes Georginas, latin america, Quetzalteca, Quetzaltenango, salsa, spa, travel, Xela by backpackerina. Bookmark the permalink.